3D printing at CES was once again well represented. 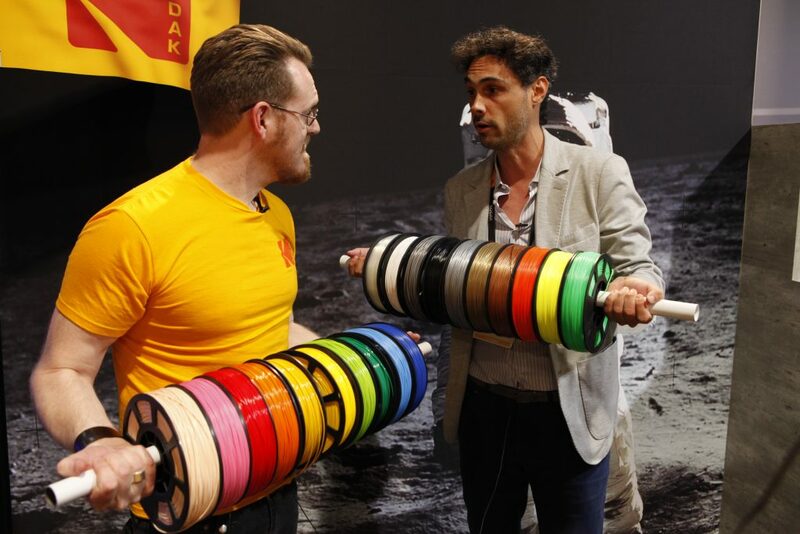 But what were the main 3D printing trends and new 3D printers launched at the electronics show? I asked 13 of the companies with 3D printers at CES 2018 for more insights. 3D printer manufacturers, specifically those in the desktop market, were joined by several 3D printing material companies and 3D scanning companies. However, the major industrial 3D printing enterprises did not attend – this is the consumer electronics show after all. In total over 50 companies linked with the 3D printing industry were present. Notably approximately one third of these enterprises are from China, with Shenzhen representing more than most. This analysis is broadly in line with the wider exhibitor picture, leading some to rename the Vegas event as the “Chinese Electronics Show”. In total 482 CES 2018 exhibitors had Shenzhen in their name. One piece of serendipity, that marketing departments could not have forecast, was the CES Blackout of 2018. For 2 hours on Wednesday large areas of the Las Vegas Convention Center were without power. 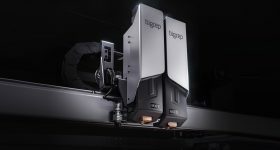 While this brought increased foot traffic to those in the North Hall, like Aleph Objects, for those companies 3D printing when the power went down – it was also an opportunity. Raise3D in particular were quick to highlight their resume print function. 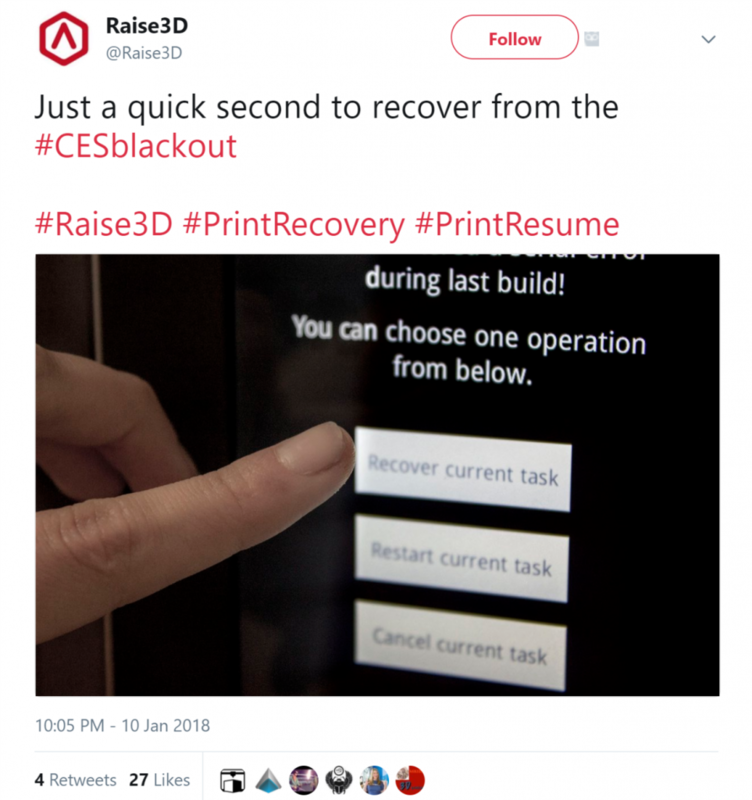 The 2018 CES Blackout was an opportunity for Raise3D to demonstrate their resume print function. While several of the 3D printing exhibitors at CES 2018 expressed reservations about attending next year’s CES, this is a view I hear quite frequently about the now crowded calendar of 3D printing events. 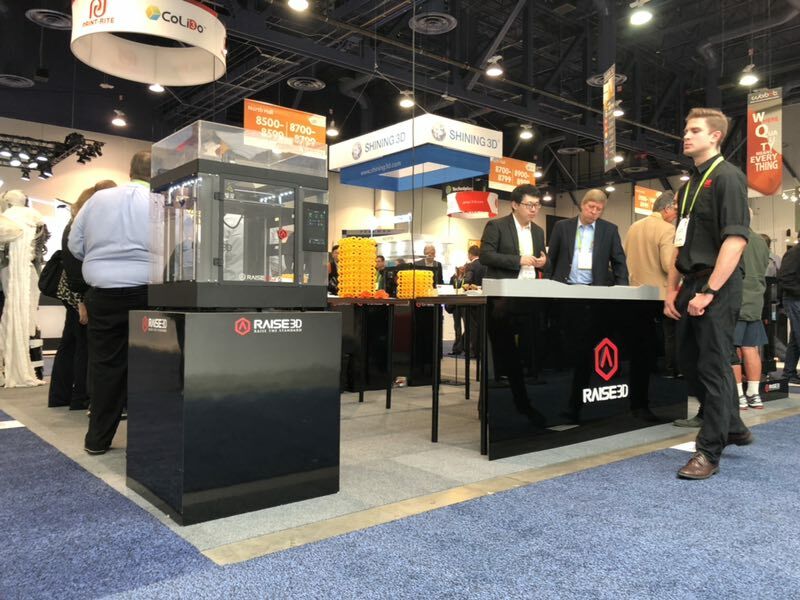 Although, some companies have already ceased to attend, CES is still valuable for enterprises both seeking to establish themselves in 3D printing, for example Kodak, and those building on success, such as XYZPrinting. 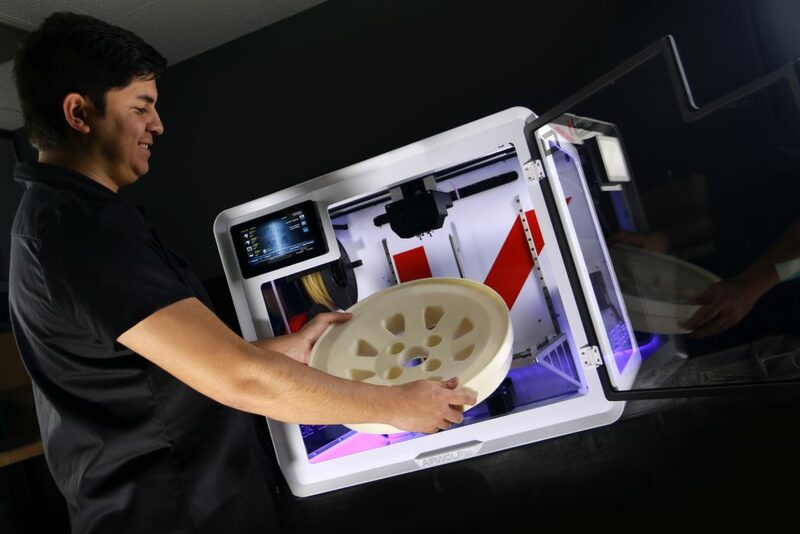 Airwolf 3D released the EVO Additive Manufacturing Center at CES this year. It’s definitely one of our most significant products to date — it took years of perfecting 3D printing technology for us to get to this point, and we’re incredibly excited to have a machine that truly improves the desktop manufacturing experience. 3DPI: Has the reaction of visitors to 3D printing changed/what is the perception of visitors to 3D printing in 2018? 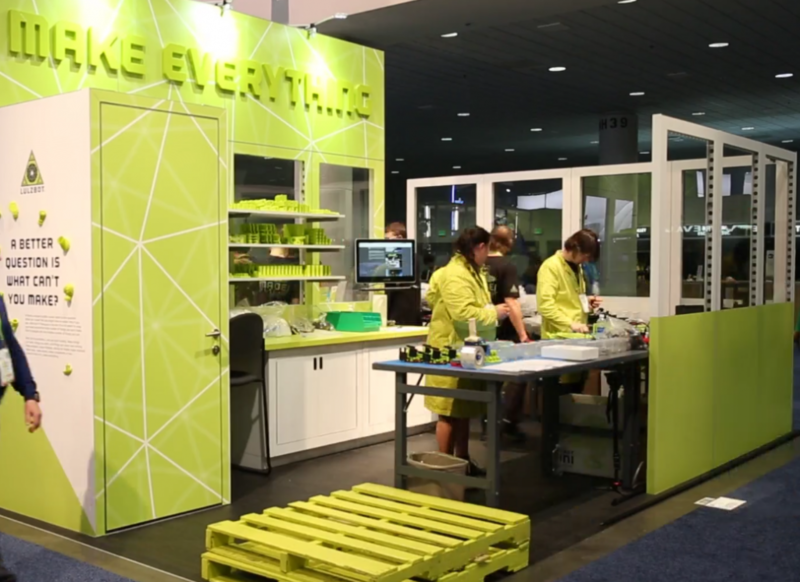 3D printing isn’t the novelty it once was and you can see that in the reactions of attendees. But now that people are more familiar with 3D printing, they have a greater appreciation for advanced features like air filtration, metal printing, and thermal management. 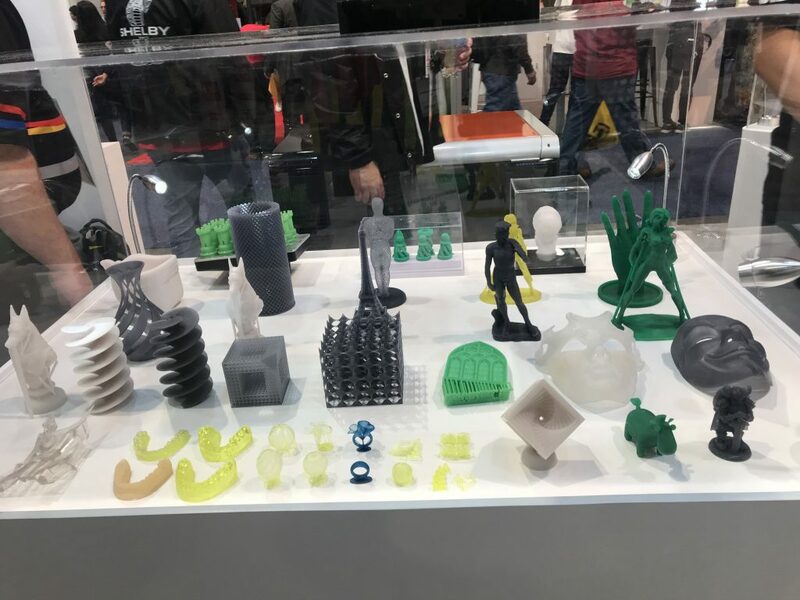 3DPI: What non-3D printing technology at CES 2018 stands out? I’m impressed with LG’s new 4k OLED display that literally rolls up like wrapping paper. It opens up so many possibilities for design and entertainment. For CES 2018 we brought our factory from Colorado to Las Vegas. Maybe not the whole factory, but enough to build 20 special edition LulzBot Mini 3D Printers during the show. As far as we know, no one has ever manufactured their products on the show floor at CES before, and so far the reception has been great. When people see the booth you can see them processing for a second and then they get it. They realize that we’re using our 3D printers to make more 3D printers, and the fact that we’re confident enough to do that live at the show speaks volumes about the reliability of our machines. Adding to the excitement, we are giving away 16 of the printers we build here. CES attendees can enter for a chance to win with a badge scan at our booth and we’re also collecting entries online at lulzbot.com/make-everything through the end of the show. All the contest rules and restrictions can also be found there. Lastly, we announced 10 new products in November and are showing them off here at CES. We have our Dual Extruder v3 Tool Head, Modular Print Bed Systems, Aerostruder Tool Heads, and the LulzBot Mini LCD Controller. With the exception of the LCD Controller which will be released soon, all are available for sale on LulzBot.com. Lots of new stuff for people to see here. 3DPI: What is the perception of 3D printing at CES 2018? The 3D printing area at CES has definitely changed. People are no longer wowed by the technology like they were four years ago, it’s not the new hyped thing. That said, we’ve still seen a ton of interest, and it’s coming from a more informed perspective. The people coming to the booth this year, for the most part, know what they want to do with additive technology and are looking for the right combination of hardware, software, and materials to make it happen. Demonstrating our printers as a manufacturing platform (the way we use them) seems to really be resonating. Integrated AI seems to be everywhere this year. From self driving cars to “smart assistant” products, the big thing seems to be putting more electronic brains in more things and giving those brains more access and control. I just encourage folks to think about the importance of understanding how these systems work. Free Software and Open Source Hardware is key to making sure that systems designed to keep us safe and connected don’t end up threatening our safety and freedom. We are exhibiting some functional applications from different fields, all made in LS technique and Windform composite materials. For example, a steering wheel for Formula SAE which is both a prototype and a fully functional component. It is completely customizable and lightweight steering wheel body, which has the potential for new handles, front panel, electronics and paddle shifters to be added or modified with ease. UVic Formula Motorsport designed and developed it, and CRP USA manufactured it utilizing 3D Printing technology and Windform XT 2.0 high performance carbon fiber reinforced composite material, to be used and performed both through testing and competition. Then we are showing, for the first time in U.S., Tundra-M, the functional prototype of Hexadrone’s first fully modular and easy-to-use drone for industrial and multi-purpose tasks. The drone’s body and arms are manufactured in Windform SP and Windform XT 2.0, carbon fiber reinforced composite materials from Windform family of composite materials. Another component on display is TuPOD, the first complete 3D printed satellite to be launched from the ISS, designed both as a CubeSat and as a dispensing system for two Tube Satellites. It is in Windform XT 2.0. TubeSats are cylindrical in shape and not compatible with the normal CubeSats deployer platform (P-POD) on ISS, an innovative nano-satellite, TuPOD (Tubesat-POD), was developed to address the issue. We are exhibiting dashboards and seat we manufactured for Energica Ego motorbike. CRP USA 3D printing at CES. 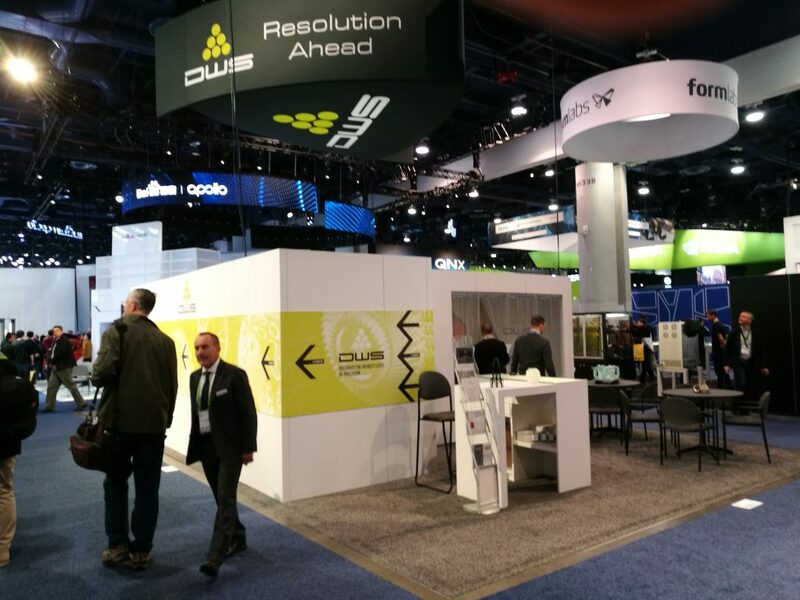 3DPI: What is the perception of CES visitors to 3D printing in 2018? Visitors are amazed and impressed of what you can actually build with laser sintering technology and Windform composite materials. At CES we are having exposure o consumer level. People who stop at our booth are confused, they cannot understand what we exactly do, but once they understood it, they are amazed! We’ve brought a dozen startup businesses that Dassault Systèmes is supporting through our startup support programs (including our Global Entrepreneur Program, which we announced during the show). These startups include several businesses leveraging 3D printing, including custom-printed mouthpieces for musicians, to printable solar energy cells. All of these businesses are designing and creating their products with the help of Dassault Systèmes’ 3DEXPERIENCE Platform. 3DPI: Has the reaction of visitors to 3D printing changed in 2018? The rapid development of new 3D printing capabilities continues to open the eyes of users and businesses alike. Examples like the growth of 3D printed metal objects, and 3D printed conductive objects for electronics have shown that much broader applications of 3D printing on the horizon. The growing production speed around 3D printing in general is also showing the potential for much more than just small-batch manufacturing or prototyping. When you combine these new capabilities with overall maturation and increased efficiency, it’s easy to see the future potential. 3D printing allows businesses to design and manufacture organic shapes with freedom that didn’t exist before, including shapes that aren’t possible to produce with traditional subtractive manufacturing. Whether for prototyping or end-use, 3D printed parts can be custom-designed, produced on demand faster than ever, and thanks to next-generation composite materials, they can be both stronger and lighter than parts made from traditional materials. The next big accelerator for 3D printed parts will be businesses adopting software platforms that offer design toolsets, simulation and testing to ensure structural integrity, and manufacturing processes all available in one centralized platform. Wearable and biometric technologies are becoming increasingly pervasive, from watches and phones, to clothing, and now to cars and in-home devices. There’s going to be a vast network of devices monitoring and collecting data about us…but in a way, collecting the data is the easy part. The real challenge will be successfully integrating and securing all these data-streams, and analyzing them in a way that turns information into insight. A mountain of data isn’t very useful if you can’t draw any intelligent conclusions from it. 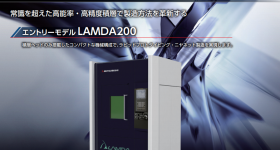 DWS is exhibiting XCELL 6000, a groundbreaking concept: the first ever built-in work cell, all in one solution from the 3D file to the ready to use parts. XCELL gives a new experience in 3D printing: once the file is imported no other operations are required to obtain the printed object which comes out already washed and UV cured without any other intervention. The system uses XPOD, a new concept of smart cartridge with advanced material management: the material not used returns automatically inside the cartridge before the extraction. DWS introduces at CES also a new generation of 3D printers: XFAB 2500 SD and 3500 SD following the market trends demanding for customization, high resolution, speed and quality. 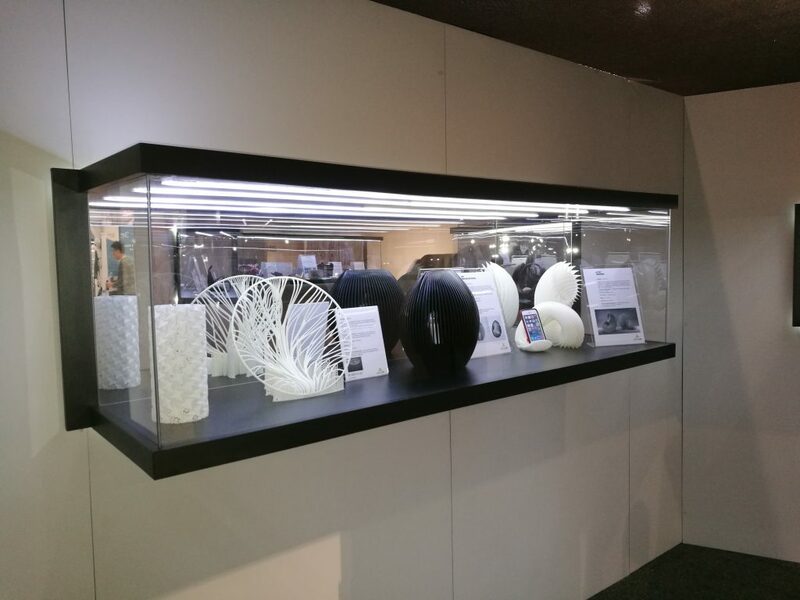 DWS is displaying a wide number of 3D printed sample models with the well-known accuracy and resolution. DWS 3D printers at CES. 3DPI: What is the understanding of visitors to 3D printing in 2018? We have noticed that visitors consider 3D printing not only has an opportunity but a chance to improve their business, cutting times and costs. 3D printing is effectively becoming an unavoidable part of production processes. Autonomous driving is the main topic for this 2018. We must expecting cars hitting the streets simply equipped with a front facing camera, maybe by this year. This year at CES, Formlabs is introducing two new resins: Rigid and Grey Pro. Grey Pro Resin has high precision and versatile material properties, including moderate elongation and low creep, which make it great for concept modeling and functional testing. Rigid Resin is Formlab’s first glass-reinforced resin and offers very high stiffness and a polished finish. At the booth, we’ll have the Form Cell, Fuse 1, and we also are demoing with 3Shape, the combined power of the Form 2 and 3Shape Phoenix in-ear scanner to make customized earbuds. We’re excited about this demo because it’s a great example of the potential of mass customization. The human body is one of the most custom and unique shares, and the ear canal is no exception. 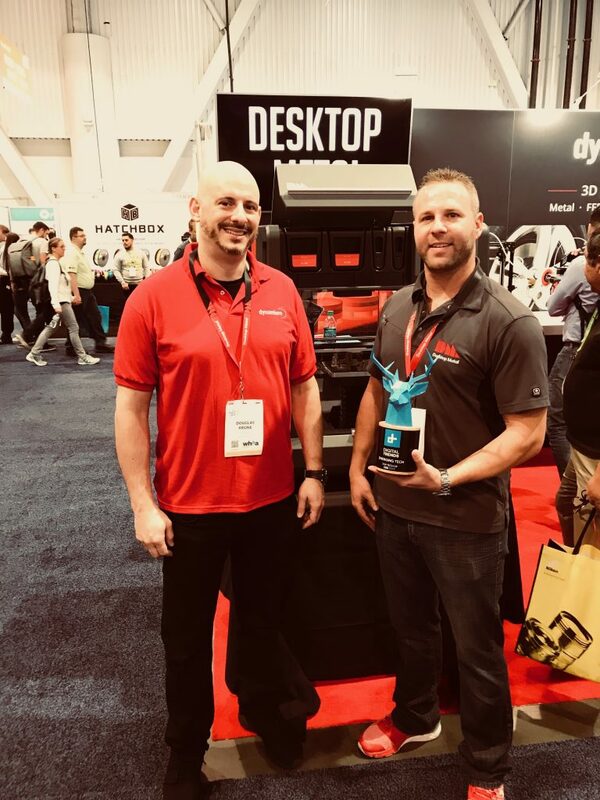 3DPI Has the reaction of CES 2018 attendees to 3D printing changed? 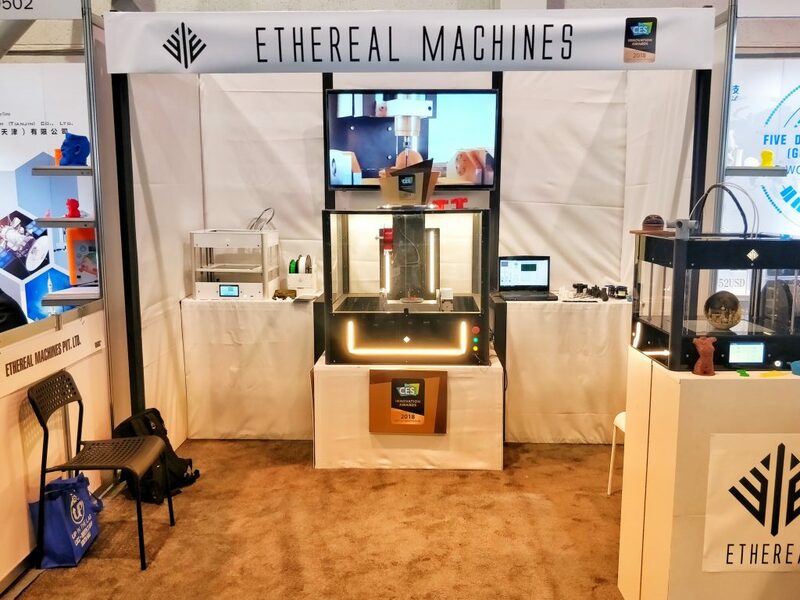 We’ve been coming to CES for more than 5 years now, when we first started we were one of two or three 3D printing vendors, it wasn’t something that was really on the CES organizers radar and for the audience it was very new. Fast forward to this week, there is a whole section of the show dedicated to the technology and the audience has matured, they’re more aware of the difference between the machines and materials. For us, this year has been a showcase of mass customization becoming a reality. With the maturation of our materials, our printer is being used for more end use parts, for things like the creation of custom earbuds or jigs and fixtures on the manufacturing line. Walking around the show floor there is so much competing for your attention it can be really hard to take it all in. A lot of fun and unique technologies everyone is talking about that we’ve seen showcased include an autonomous race car, a lot of robots and drones. We are exhibiting the KODAK 3D Printing Ecosystem: an integral solution for the 3D printing professional, featuring a reliable, dual extruder and fully enclosed 3D printer, a wide range of top-quality filaments and the software required to facilitate and enhance the whole 3D printing experience. Kodak 3D printing at CES 2018. 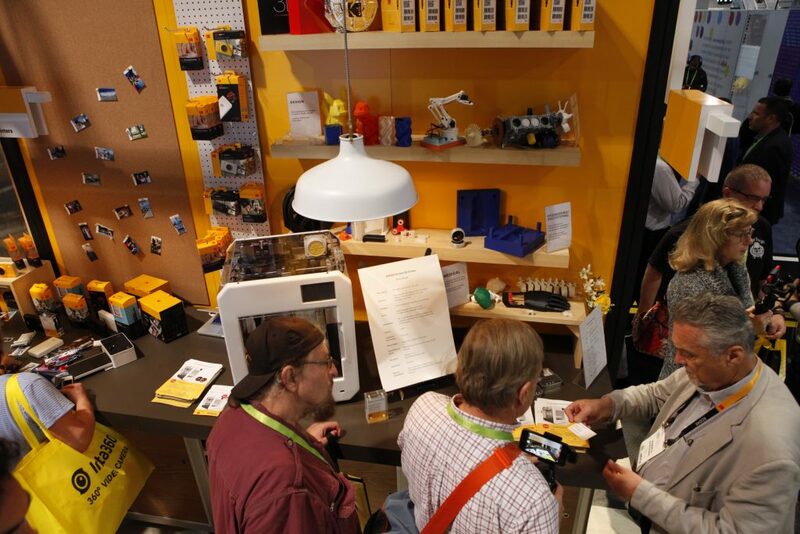 3DPI: What are your thoughts about 3D printing at CES? 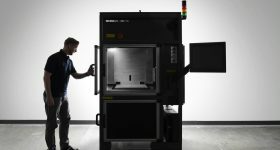 While this show may have lost attraction for many players in the 3D printing field, we at Kodak consider it a great opportunity to reach professional markets eager to enter 3D printing and that feel confident on a reputed technology leader. 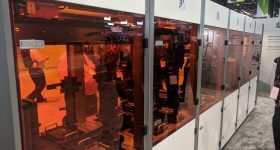 3DPI: How does the Kodak 3D printer tap into trends at CES 2018? We believe the trend towards a professional market has consolidated. Users are seeking for reliable, repeatable and accurate solutions. 3DPI: What are you exhibiting at CES 2018? Raise3D N-Series 3D Printers along with vertical application samples, such as car spoiler mold, prosthetics, parking structure, full body knight armor sets, jigs & fixtures, several electronics prototyping models and more. 3DPI: What is the perception of visitors to 3D printing in 2018? The application is more mainstream and customers are looking to put 3D printing into manufacturing. We have more customers from Fortune 100 companies and they are very impressed by our printers and samples. Self-driving cars and electric cars. Sunflower solar patio umbrella from ShadeCraft is also a hit in CES 2018 as well. 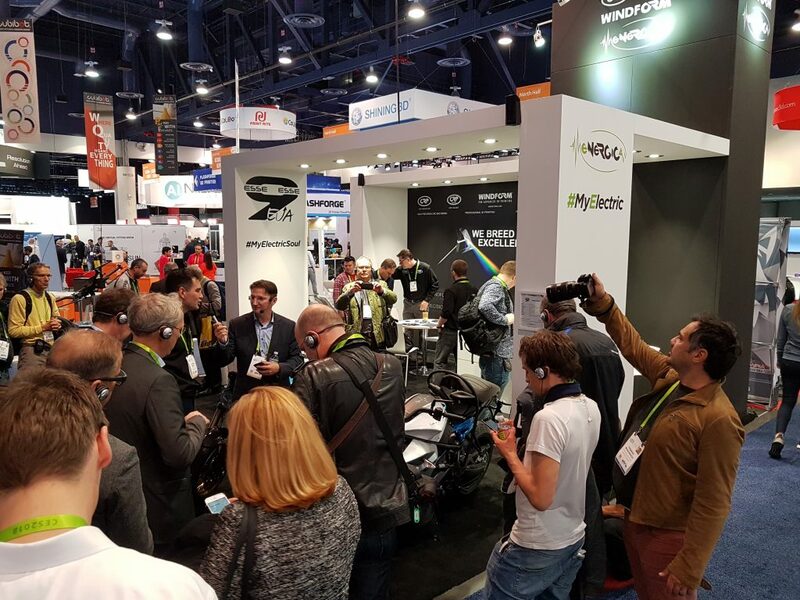 We are showcasing at CES several additive, generative and cognitive technologies that together are demonstrating how Techniplas is making the connected world. Specifically we are showcasing our lightweighting and cognitive lighting capabilities on a remake of a Mini Cooper that embodies the combined power of our latest additive manufacturing and topology optimization capabilities. The Mini Cooper is leveraging the combined power of our open innovation program in various section of the vehicle as well as a first ever cognitive sun roof with programmable lighting. As we have done in previous years, we are sponsoring the rinspeed concept car again this year with front and rear embedded cognitive lighting facia. The lighting facia was 3D printed at our new additive manufacturing center in California. 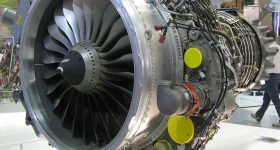 We are also launching Techniplas Prime, the immediate availability of Techniplas Prime, a proprietary e-manufacturing platform that leverages its core engineering expertise and manufacturing facilities together with dozens of its qualified manufacturing partners and new additive and generative technologies to fulfill orders placed through its new platform worldwide. Techniplas Prime is first to provide automated lightweighting solutions, additive manufacturing options with instant pricing quotations and localized manufacturing. Techniplas Prime is the only one-stop shop automotive design-to-manufacturing service that instantly connects engineers and designers to the optimal manufacturing solution at the best price across a wide range of capabilities worldwide. Through its decades long proven process, Techniplas Prime manages each project from its pre-production stage through tooling, manufacturing, final inspection and product delivery at OEM’s production quality and scale throughout the entire automotive life cycle. The perception is that 3D printing is maturing and mainstreaming. 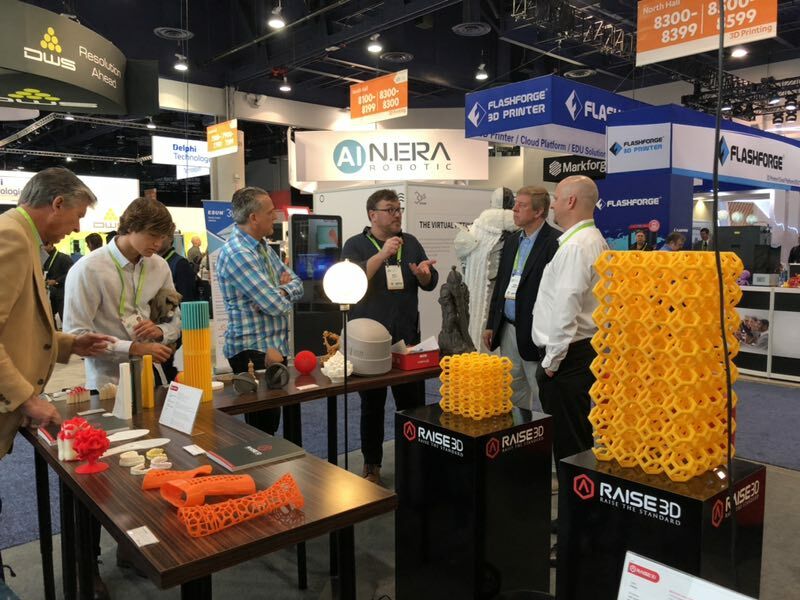 Placing the 3D printing marketplace next to the automotive section of CES speaks volumes about the growing importance of additive technologies to the future of automotive manufacturing. We are blown away by the growing impact of connected lifestyle technologies and in particular cognitive AI and its impact on personal mobility and Industry 4.0 preparedness. We are living in interesting times and CES 2018 is a great place to see where its all headed. 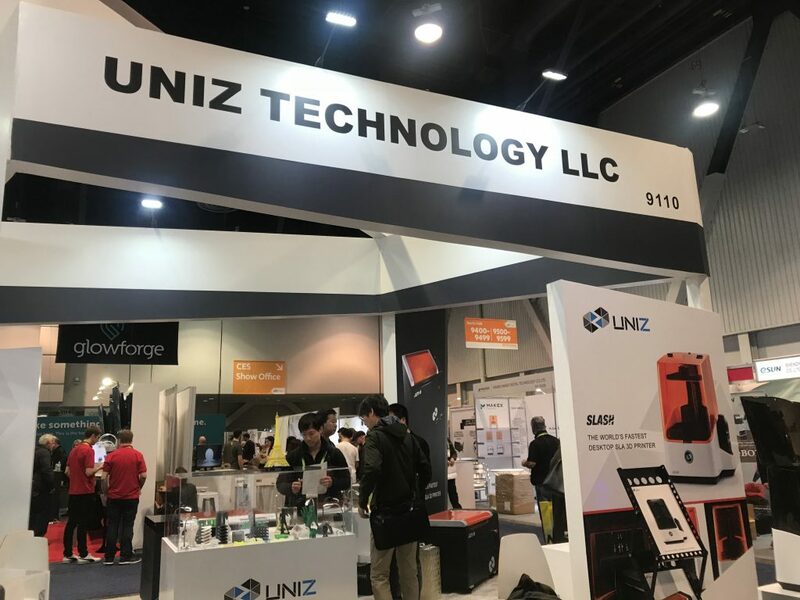 At CES 2018 Uniz will demonstrate a new 3D printing technology called uni-directional peel (UDP) and release five new Stereolithography 3D printers—three desktop (SLASH+, SLASH Pro, and SLASH Online), two industrial (zSLTV and zSLTV-Mini)—that utilize the new technology. Uniz 3D printing at CES. Visitors are growing mature. The fan base and user base of Uniz 3D printer is bigger than last year. They start to acknowledge the Uniz brand image for 3D print technology innovation instead of just a Kickstarter hit campaign. Electric/Auto Car, Robotics, Wearables/Health products like smart tracking shoes. 3D printing, especially Uniz 3D printers are helping these companies to accelerate their R&D process by offering fast and accurate 3D prototyping. Andy Kalambi, President and CEO, Rize Inc.
We are showcasing Rize™ One, the world’s first hybrid 3D printer, which is featured in Dassault Systèmes’ booth 8300 in the North Hall of the Las Vegas Convention Center throughout the show. 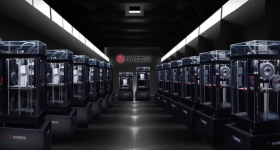 Visitors will get a demonstration of Rize 3D printing, see Rize 3D printed parts and have an opportunity to get a functional 3D printed giveaway. We will also demonstrate how Rize shares Dassault Systèmes’ inclusive strategy for enabling collaborative technology ecosystems to develop and deliver new and sustainable solutions in consumer-centered sectors, such as healthcare, as well as in commercial sectors. 3D printing is being looked at more for functional and production requirements than in previous years and there is a lot of interest across different industries. In addition, many non-traditional 3D printer users are now looking at 3D printing. Autonomous, connected transportation stands out at this year’s CES event, from a large number of well-known brands and startups. We are showcasing new ceramics 3D printer – Ceramo One. Kwambio engineers created a new form of binder jetting 3D printing technology, which works with clay-based powders. We assembled a new high speed and a high precision 3D printer, which sped up our production and optimized the manufacturing process. Ceramo One, ceramic powders, and glazes will be available for pre-order starting later this month. 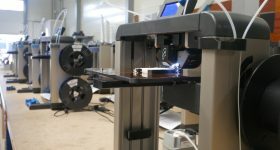 3DPI: Has the reaction of visitors to 3D printing changed? Clearly, 3D printing is not a hot topic anymore – it’s common. 3D printing ceramics is a different thing. Many people are curious about it because they see products that can’t be manufactured in any other way. We see a lot of interest in it though it’s not a piece of technology that you’d keep in your basement. Everyone talks about robotaxis, self-driving cars, AI platforms, home automation and all kinds of robots. It’s cool to see that so many cool ideas actually came to life but it’s hard to name just one piece of technology that stands out. If you are at CES, take time to explore Eureka park. Let’s say, find Ueveka’s robotic mannequin for clothing designers that can change shape and size in seconds. We are exhibiting two products. 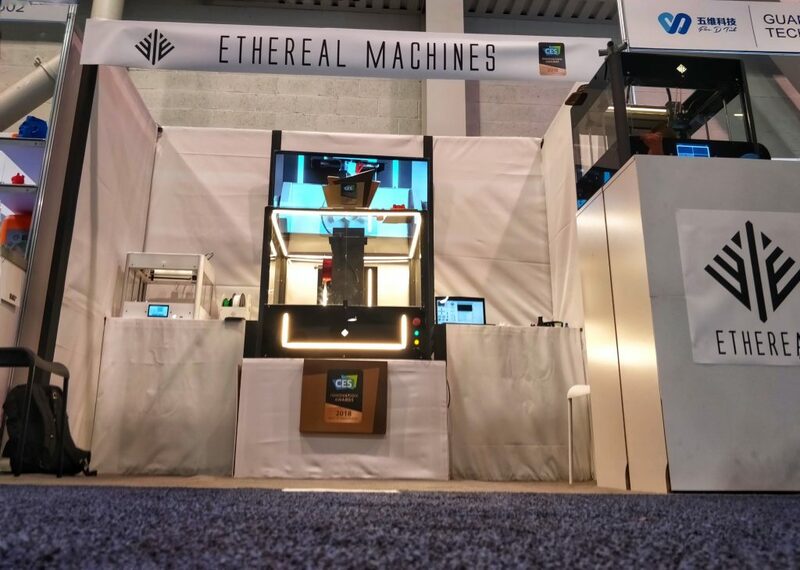 The first is a CES 2018 Best of Innovation Award Honoree which is the Ethereal Halo and the second is the Ethereal Ray which is a dual extruder 3D printer. 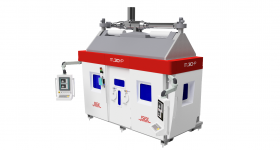 The Halo is a hybrid manufacturing machine and works on 5 axes. The Ray has a dual extruder with a 5.5″ capacitive touch screen and supports cloud slicing. This is our first CES and can thus only speak from that perspective. People want to make parts that are more complex and stronger than what they have been seeing over the last few years. They are still very excited about additive manufacturing. The autonomous driving technology has been making strides in this CES for sure. We are seeing a lot of developments and advancements in the field of AI as well. Douglas Krone, CEO, Dynamism Inc.
We are showing an array of printers, including the Desktop Metal Studio System, Ultimaker 3, Formlabs Form 2. Innovation in 3D printing is accelerating disruption of enterprise workflows—from prototyping to manufacturing processes. Enterprises can get similar-to-better results with a 10x cost savings, and they are finding news ways to take advantage of that. The latest autonomous driving technologies are the most exciting—I especially liked Toyota’s presentation. 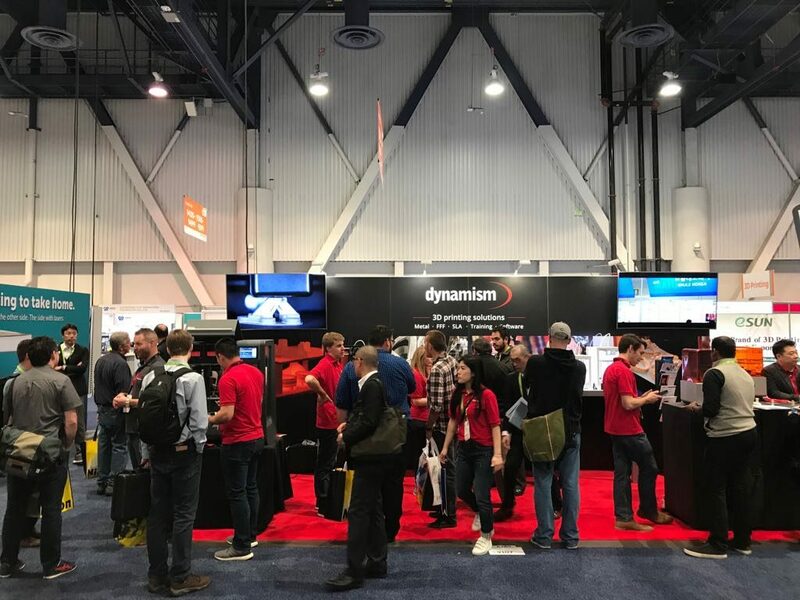 Dynamism Inc at CES 2018. So, there it is – the expert view of 3D printing at CES 2018. While the long-running electronics show in Las Vegas may not be at the top of the list of places to see truly innovative technology, CES 2018 does still provide some useful insights into the 3D printing industry. In particular how the desktop market is progressing. While FFF/FDM 3D printers were the dominant 3D printing technology at CES 2018. Formlabs mixed things up a little with both SLA and SLS. As booths are broken down, it will be interesting to learn more about the reaction of visitors to these arguably less consumer oriented technology. 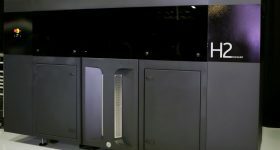 There was no big announcement to match that of last year, when Markforged announced the Metal X and their plans to bring metal 3D printing to the desktop. However, the fading hype around 3D printing is arguably a positive sign – with manufacturers putting less into the “show” of marketing and more into the “business” of making useful products. Let us know your thoughts about CES 2018 via our social media accounts on Twitter and Facebook. You can also subscribe to the 3D Printing Industry newsletter for all the latest news and insight. Our readers will decide on the most important 3D Printing technology of 2018. Make your nominations for the 2018 3D Printing Industry Awards. Nb: Eagle eyed readers will note there are more than 13 experts in this article. We’ve extended the article with additional insight.